It’s a long way to Lightning Ridge – about 800km from Sydney and Brisbane and about 60km south of the QLD border. The name of this remote outback town is already fascinating – Lightning Ridge – well known for its spectacular lightning displays during the storms that frequent the area during summer. Equally remarkable – Australia has a national treasure called Opal. The spectacular gemstone that is the envy of the rest of the world. Lightning Ridge produces nearly all of the world’s supply of black opal, the most rare and valuable form of this amazing gem. In Lightning Ridge opal is mined underground. It can be a frustrating and a fruitless endeavour, and sometimes it can be enourmously rewarding. The dream of finding opals has drawn people from all over the world to Lightning Ridge. There are social and visual experiences that can’t be had anywhere else. The Opal fields, the varied and ingenious miners’ camps, the wicked sense of humor, friendly and down to earth people, tourist attractions that have a whimsical (even eccentric) local and unique flavour. As I type this and go through my photographs I realise this is going to be a big guide…I hope you enjoy it. Amigo is a local character. He started with this impressive ironstone castle some 25 years ago….and he is still working on it. It’s the work of one man…one lovely, dedicated and passionate character. 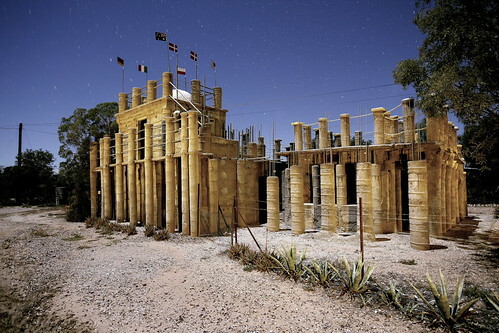 Another monumental construction, testament to Lightning Ridge’s self taught architects and builders. Empty paint buckets were filled with concrete and that’s how this monument was built.